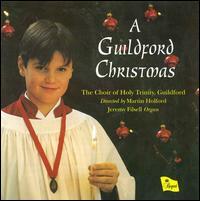 From A Guildford Christmas , by the choir of Holy Trinity Church, Guildford. Go ye out to meet him and say: tell us, art thou he that should come to reign over thy people Israel? Go ye out to meet him and say: hear O thou Shepherd of Israel, thou that leadest Joseph like a sheep, tell us, art thou he that should come? Stir up thy strength, O Lord, and come to reign over thy people Israel.